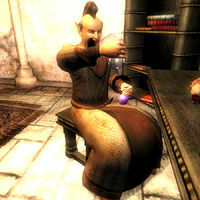 Baeralorn is a Bosmer necromancer who serves as castle mage in Anvil. He is an Associate of the Mages Guild, but is seldom seen at the local chapter, preferring to do his research in his private quarters in Anvil Castle, likely to avoid prosecution by the guild itself, which banned necromancy. He spends most of his time in the private quarters of Anvil Castle, only venturing outside from 2pm to 5pm each day when he heads to the Anvil Mages Guild. Between 8pm and midnight he attends the Countess' formal dinner. He then retires to his room, where he spends most of the night mixing potions and researching necromancy, finally sleeping from 6am to midday. The first time he meets you, he will introduce himself: "I'm Baeralorn. Anvil's castle mage. Perhaps you've heard of my work on magical resistances." And when asked about Anvil, he will describe his work in detail: "Our gracious Countess funds my research. I ward tame rats with resistance spells, then shower them with elemental attacks." His garment is particularly noteworthy since he will always wear an enchanted robe of deflection. He carries a medium amount of gold, a piece of alchemy apparatus, and a key to the castle. He also has a 75% chance of carrying various rare ingredients, such as glow dust. He doesn't wield any weapons, relying instead on a set of leveled necromancer spells for his attacks. His room, which is locked, can be found in Anvil Castle Private Quarters, on the right when entering from the Great Hall. It contains a chest and a jewelry box, both of which are locked. The chest, which is opened by one of Baeralorn's keys, contains the rare book N'Gasta! Kvata! Kvakis! and some scrolls, potions, ingredients, apparatus, soul gems, gold and jewelry. The jewelry box, which is hidden behind the bed, contains some leveled jewelry and gold. On display on a table is a full set of novice apparatus and a weak poison of silence. This page was last modified on 20 October 2015, at 05:17.